We write in response to the publication of “State-backed Financial Institution (Public Bank) for the State of California Servicing the Cannabis Industry Feasibility Study 2018,” (hereinafter “Feasibility Study”). 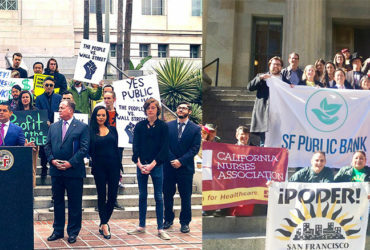 Each of the undersigned is involved in municipal or regional public banking advocacy efforts in Los Angeles, San Francisco, the East Bay, Silicon Valley, Santa Rosa, Santa Cruz, Eureka, and San Diego, and together have formed the California Public Banking Alliance to coordinate our advocacy work on the state level. First, we applaud the State Treasurer’s Office for grappling with the difficult and urgent issue of banking access for California’s cannabis industry, and for recognizing that public banking can provide solutions to failures in the private-sector banking industry. We deeply appreciate your office’s leadership role in uplifting public banking as a policy option. Unfortunately, we were disappointed with the methods used and conclusions reached in the Feasibility Study and are concerned that the promise and potential of public banking was misunderstood by the Feasibility Study authors. The Feasibility Study failed to analyze public banking models as distinct from conventional, private-sector banking models. In addition, its analysis of legal risks did not account for several countervailing factors and created an inaccurate portrayal of the legal risks associated with establishing a public bank that serves cannabis-related businesses. We urge the State Treasurer’s Office to continue its work on a state cannabis bank concept and take a more proactive role in advocating for policy change on the federal level. 1. The Feasibility Study misunderstood public banking. 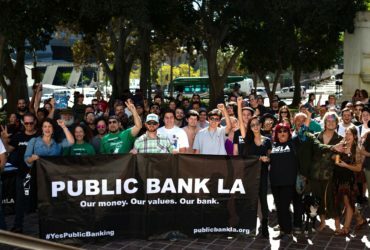 As we described in our March 2, 2018 letter to your office, the key promise and potential of public banking lies in “addressing commercial banking market failures.” Clearly, private-sector banks’ refusal to provide banking services to California’s regulated cannabis industry constitutes a market failure. However, the analyses of the three public banking alternatives examined in the Feasibility Study all proceed under assumptions and factors as if a state cannabis bank were simply a conventional bank that happened to be owned by the state. This misunderstands the purpose of public banking. 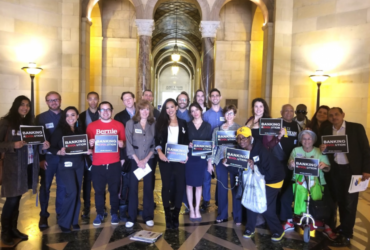 The Feasibility Study fails to account for the costs to the public of failing to provide banking access to California’s cannabis industry. As you know, because cannabis-related businesses are locked out of banking services, these businesses and their employees are forced to rely disproportionately on cash transactions, making them attractive targets for robbery and creating a significant risk to public safety. Essentially, the continued cannabis banking crisis externalizes the costs of a cash-based industry, including increased crime, to the general public. The cannabis industry’s over-reliance on cash also complicates state and local governments’ ability to collect fees and tax revenue. 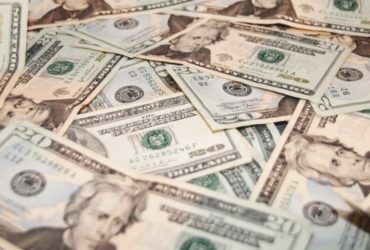 Businesses must dedicate resources and possibly contract with armored car services just to pay taxes, and likewise, state and local agencies must dedicate resources to managing large cash payments. Moreover, paying taxes and fees in cash makes it easier for unscrupulous actors to avoid paying their full tax liability; making these payments by conventional business means (wire, check, credit card) would likely increase revenue collection by both the state and localities. 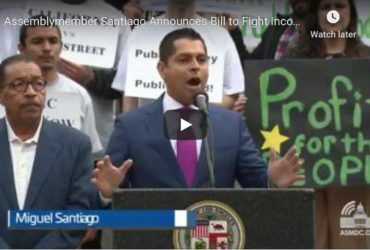 The failure to thoroughly normalize the cannabis industry by integrating it into the “transparent, regulated, tax-paying part of the California economy,” as the Feasibility Study puts it, sets back the state’s ongoing efforts to regulate the cannabis industry – another cost to the public. 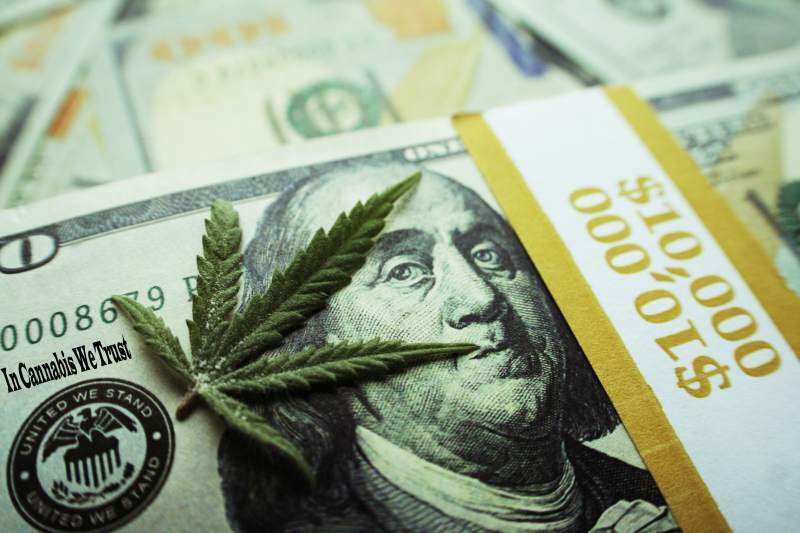 Cannabis-industry operators are forced to seek clandestine banking services, which may be terminated by the bank without notice at any time, or use large amounts of cash to pay employees, vendors, and bills. These unconventional business practices contribute to the continued stigmatization of the cannabis industry, a vicious cycle which encourages the continued viability of the illicit cannabis market. These costs, while not necessarily easily quantifiable, must be accounted for in any analysis of potential public policy solutions to the cannabis banking crisis. 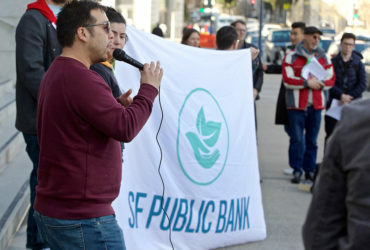 While private-sector banks may not consider the effects of their business choices on public safety or government revenue collection, it is decidedly in the interest of the State of California to take them into account.1 The need for the state to act becomes more acute with the threat of future adverse policy changes by the federal government. In conceiving of and analyzing the three public banking alternatives, the Feasibility Study placed unwarranted focus on retail banking models, to the detriment of its analysis of correspondent-banking models, such as that used by the Bank of North Dakota (“BND”). The Feasibility Study’s “detailed” narrative analysis of the correspondent bank model consists of just two paragraphs. The Feasibility Study states that “[i]t is unlikely that respondent banks would use the public correspondent bank for its non-cannabis services,” but provides no evidence or reasoning to support this conclusion. The idea that respondent banks would have no interest in availing of a public correspondent bank’s non-cannabis-related services is belied by the example of BND, which partners with a thriving network of community banks and credit unions to provide services including agricultural and business loans.2 The Feasibility Study correctly notes that “the correspondent bank option requires that existing respondent banks agree to enter the cannabis banking market” (see Feasibility Study at D-61). Indeed, a public correspondent bank would incentivize private-sector respondent banks to provide services to cannabis-related businesses by lowering those respondent banks’ barriers to entry to cannabis banking. A public correspondent bank could also be the locus of data-sharing among regulators and respondent banks to serve Know-Your-Customer and Customer Due Diligence needs, one of the recommendations of the Cannabis Banking Working Group, convened by your office.3 A public correspondent bank could also provide reporting and monitoring services in compliance with the 2014 guidance issued by the Financial Crimes Enforcement Network (“FinCEN”) for banking with cannabis-related businesses.4 While existing financial institutions balk at the prospect of following this guidance due, in part, to the high cost of compliance, the public benefit from resolving the cannabis-banking crisis should more than account for the compliance costs. In addition, the Feasibility Study’s discussion of two retail-based public banking alternatives relies on a number of unfounded assumptions, two of which we address here. With regard to the first retail bank model, wherein the public bank would provide direct retail services exclusively to cannabis-related businesses, the Feasibility Study asserts, without any supporting evidence, that “the availability of clandestine banking, however fleeting it may be, would still offer competition to the bank and would require that the pricing [of banking products and services] be relatively in line with pricing for standard business banking products and services” (see Feasibility Study at D-7). In fact, we are aware of cannabis operators who currently pay a premium to secure a stable banking relationship, and it is likely that many others would do the same if the opportunity were available. 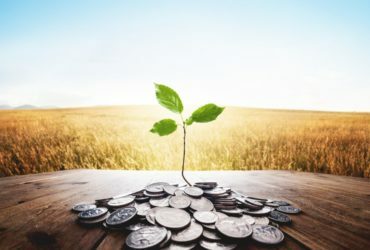 The second retail banking model addressed by the Feasibility Study is a retail bank which serves cannabis-related businesses along with other entities in which only 10 percent of deposits would be from non-cannabis sources. The Feasibility Study assumed this small percentage of non-cannabis deposits because it “would anticipate that the public bank will have limited appeal to individuals unrelated to the cannabis industry” (see Feasibility Study at D-56). Predictably, with such a small fraction of non-cannabis deposits, the model is found to be unacceptably concentrated in the cannabis industry. However, the assumption of “limited appeal” of deposits in a state-backed financial institution is completely unsupported. 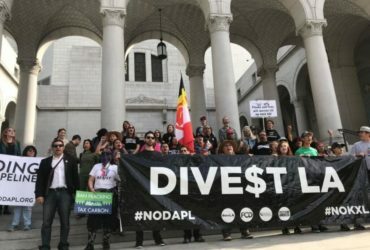 The Feasibility Study fails to consider the possibility of a state public bank holding some of the state’s own deposits, let alone the deposits of local agencies. As we described in our March 2018 letter, there are many other unmet banking needs which necessitate a state public bank and/or network of regional public banks. 2. The Feasibility Study’s analysis of legal risks is inadequate. Although the public is not privy to the full legal analysis provided by the Office of the Attorney General, the assessment of legal risks contained in the Feasibility Study is inadequate in scope and creates a distorted image of the relevant legal risks. In general, the public statements made at the the release of the Feasibility Study in combination with the discussion in the Feasibility Study of legal risks invoke unfounded fear, uncertainty, and doubt about criminal liability, especially for individuals employed by the state. For example, the Racketeer Influenced and Corrupt Organizations Act (“RICO”) was repeatedly invoked, even though the Feasibility Study admits that “[s]tate and local governments are generally immune from RICO civil liability because they cannot form the necessary criminal Intent.” Moreover, while much is made of the Federal government’s authority to impose civil and criminal forfeiture, as well as civil monetary penalties, on banks and bank employees or officers, the Feasibility Study is silent on whether or how often such enforcement actions actually occur, in other words, the likelihood of federal enforcement.5 In fact, the Federal government has not, to our knowledge, seized any bank accounts, nor penalized any banks, of the various state agencies, cities, and counties – in California or in other states with laws regulating cannabis – which collect taxes and fees from cannabis-related businesses. Indeed, while the Feasibility Study only glancingly mentions the partial “safe harbor” provided by the Federal government through its 2014 FinCEN guidance for banking cannabis-related businesses, there is no mention of the fact that Congress has adopted an appropriations rider expressly forbidding the Department of Justice (“DOJ”) from spending funds to prevent states’ implementation of their own medical cannabis laws. A federal Court of Appeals has held that this appropriations language – which has been renewed in every continuing resolution funding the Federal government since its initial adoption in 2014 – means that the DOJ may not prosecute defendants who are fully compliant with state medical marijuana laws. United States v. McIntosh, 833 F.3d 1163 (9th Cir. 2016).6 Thus, contrary to the Feasibility Study’s assertion that bank employees could be federally prosecuted for aiding and abetting the sale of cannabis under the federal Controlled Substances Act, such prosecutions would be limited to adult-use cannabis only, which in practice, have not been brought under the current federal Administration. The Feasibility Study focuses on legal risks associated with operating a public bank that serves cannabis-related businesses, when a more appropriate inquiry would focus on the legal risks of starting-up a public bank that serves cannabis-related businesses. 3. Preparation for a California Cannabis Bank should be used to advocate for policy change on the federal level. As former State Treasurer John Chiang noted in his letter introducing the 2017 Cannabis Banking Working Group report, the cannabis banking problem can be approached as a continuum, with full federal legalization of cannabis as an endpoint, and legislation shielding financial institutions serving the cannabis industry as a stop along the way. One way to progress toward these goals is to proactively engage with the federal government and assert our state’s interests in the federal system. If California took steps towards establishing a public bank to serve the cannabis industry, federal regulators and elected officials would be forced to acknowledge the urgency of the cannabis banking crisis. The Feasibility Study aptly notes that state employees would enjoy immunity from federal prosecution under the First Amendment for “petition[ing] the Government for a redress of grievances.” Thus, “[t]here should …be no criminal liability for the state or any state employee for preparing for review a bank business plan and presenting it to the federal government for review” (see Feasibility Study at D-33). There is no legal risk associated with taking steps to start a public bank that serves the state’s cannabis industry. As discussed extensively throughout the Feasibility Study, the process of establishing a bank and gaining approval from the relevant regulators generally takes multiple years. If the aim of the undertaking is to persuade the relevant stakeholders to effect policy changes like removing cannabis from the Controlled Substances Act or protecting financial institutions that serve state-regulated cannabis businesses, then that multi-year process means there is more time to build pressure on Congress and the Executive Branch to solve the cannabis banking crisis. We urge the State Treasurer’s Office to follow the Feasibility Study’s recommendation at D.1.8.6 – i.e., to seek a formal written opinion from the Department of Business Oversight as to whether a public bank could be established under the existing Commercial Bank Charter. The State Treasurer’s Office could then begin to develop a business plan to submit to the Federal Reserve in order to receive a master account. Based on the experience of Fourth Corner Credit Union in Colorado, it seems unlikely that the Federal Reserve will issue a master account to a financial institution that plans to serve cannabis-related businesses as a core part of its customer base. 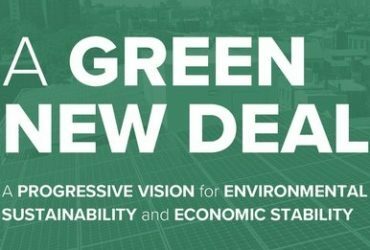 Regardless, the very act of developing a business plan for a cannabis-serving bank with the imprimatur of the state with the largest economy in the country would serve the purpose of helping to set the policy agenda at the federal level. We recognize that to continue to pursue a public cannabis bank in the face of the barriers identified in the Feasibility Study is a daunting task. However, we believe that this is exactly the type of challenge that demands the visionary thinking and bold leadership for which you are known. We hope that your office will consider our feedback and suggestions in determining next steps in addressing the cannabis banking crisis in our state. Thank you for your attention and dedication to this matter. 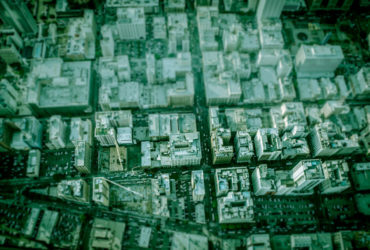 The Feasibility Study inaccurately describes California’s cannabis industry as “nascent.” While the robust regulatory system established by Proposition 64 and following legislation is relatively new, California first legalized cannabis for medical use over twenty years ago, with Proposition 215 in 1996. Many businesses in the state’s cannabis industry were established under the Prop. 215 scheme and some have been struggling with bank access for over two decades. Mitchell, Stacy. “Public Banks: Bank of North Dakota,” Institute for Local Self-Reliance (July 2, 2015). https://ilsr.org/rule/bank-of-north-dakota-2/. We believe that FinCEN’s 2014 guidance has contributed to an increase in cannabis-related financial transactions occurring through private channels, out of the view of regulators. It is likely that this trend would grow under the Feasibility Study’s recommendations. While these appropriations riders are not a permanent fixture of the United States Code, it is extremely unlikely that Congress would fail to renew such a rider in upcoming funding measures.